Off we went so that my outgoing five-year-old could see his leader from the previous week whom he adored. He got about four feet away and clammed up, barely making eye contact. “Why don’t you show her your new socks, buddy?” I suggested as a way to break the ice. 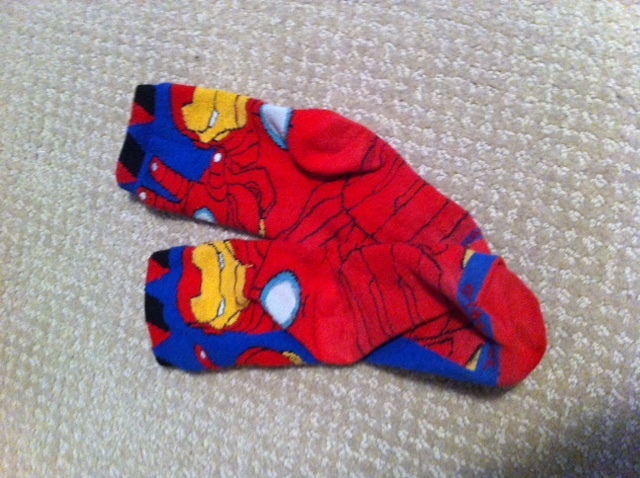 He quietly lifted up his leg so she could see his Ironman socks. She feigned the exact right level of enthusiasm, but my little guy was still acting shy. We headed back to our group of friends to continue our conversation. A few moments later he was making eyes at her again from behind my legs. “Would you like to go back over?” I asked. So off we went again and he belted out a hearty “HELLO” and scurried away, giggling nervously (not creepy at all, nicely done). Of course it was, I knew it all along. No names have been changed as the only identity needing protection is mine.